Thanks for the coming and visit us at our booth L0802a during 25th to 28th March, 2015. In the lighting fair, we demo our patented NON-GLARE design LED products including spot light and also track light, and we would like to share our happiness that we got the award of 2015 Taiwan INNOVATION PRODUCT. Goldyear is especially noted for its integrated production capability for LED lightings，as it can develop nearly all necessary components and accessories，such as lens and power drivers，independently in its factories，and turn out LED lamps meeting such international standards as UL，CUL，TUV，SAA，and RoHS. 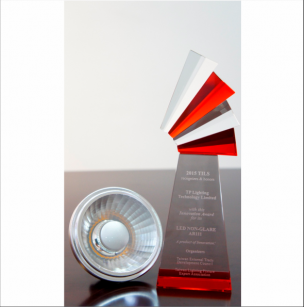 The company claims that the achievement can be mainly attributed to its unstinting dedication to R&D of LED lightings. Consistently delving into LED lightings, we have developed a revolutionary product AR111-G2 12W utilizing precise secondary reflector technology to achieve its extreme lumen output from the LED light source, Thanks to our patented thermal dissipation technology and patented construction design, the AR111-G2 12W maintain the same size as traditional halogen AR111 lamps and can deliver thermal control for optimal performance without the use of large heat-sink. The special designed optical system gives beautiful even light beam: no rings or botches, which makes the light performance “just like a halogen". By using the same patented construction design, Goldyear has developed a series of non-glare lamps such as small size of MR16 and GU10 for exactly the retrofit use, 8W AR70, high power PAR lamp, and different size of down light. If you’d like to get more information about the patented non-glare products, please kindly contact us soon.